Winners in Kinshasa in 2008 but since that time, in the ensuing four editions, having to watch their arch rivals, Egypt accept the plaudits; Nigeria regained the Men’s Team title at the 2018 ITTF-African Championships in Port Louis, Mauritius on the evening of Wednesday 5th September. At the final hurdle, a three matches to one win was recorded against Egypt, a contest which was arguably closer than the score-line may suggest, all three victories for the champions elect were recorded in full distance five games duel. Quadri Aruna set Nigeria, the top seeds, on the road to victory against the second seeds; he beat Ahmed Ali Saleh (11-9, 9-11, 11-3, 9-11, 11-2), before Mohamed El-Beiali levelled matters by overcoming Bode Abiodun (12-10, 11-9, 11-4). The contest in the balance, experience counted, Segun Toriola, who in just under two weeks’ time will celebrate his 44th birthday, beat Khalid Assar (13-11, 1-11, 8-11, 11-8, 11-8) to turn the tide in favour of Nigeria. 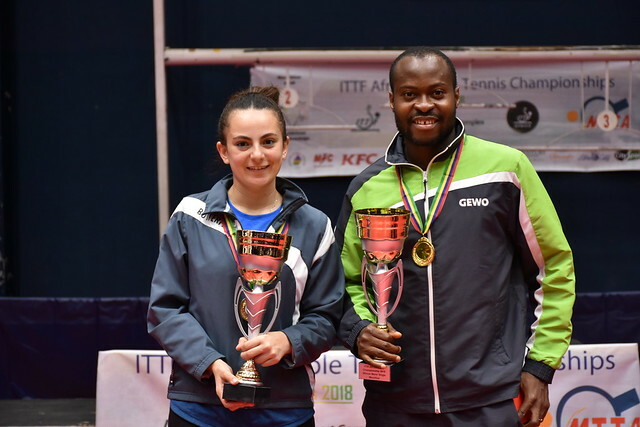 Hard fought contests, it was exactly the same in the engagement that brought proceedings to a close; Quadri Aruna recovered from a two games to one deficit to beat Mohamed El-Beiali (5-11, 11-7, 11-13, 11-5, 11-6) to seal the title. Meanwhile, in the principal play-off fixtures for the immediate ensuing positions, Togo with Mawussi Agbetoglo, Kokou Dodji Fanny and Alarou Assou on duty, recorded a three-two win in opposition to Algeria’s Larbi Bouriah, Sami Kherouf and Mohamed Lazizi to secure third place. Fifth position finished in the hands of South Africa; in the play-off contest Theo Cogill, Kurt Lingeveld and Terrence Mathole emerged successful by three matches to one against the Mauritius outfit formed by Rhikesh Taucoory, Brian Chan Yook Fo and Allan Arnachellum. Proceedings resume in Port Louis on Friday 7th September with the individual events.